Thinking about getting a puppy and thinking small? You'll find many purebred pups from which to choose. There are also designer dogs. Designer dogs are a deliberate mix of two breeds (sometimes more) to create a new type of dog that has hopefully inherited the best qualities of each parent. If you're the type of person who likes to do your research and consider all available choices before making up your mind, do not look at the Shichon puppy first. Once you've set your eyes on one of these adorable dogs, it's all over. All puppies are cute, but the Shichon puppy takes cute to a whole new level. A cross between the bichon frise and Shih Tzu, Shichon puppies are truly irresistible. Also called zuchons, Shichon puppies are small, soft, and fluffy with big, round eyes and a sweet little button nose. No wonder they're called "teddy bear puppies." Shichons come in a wide variety of colors and color combinations — black, white, tan, chocolate, and apricot, to name just a few. Shichon adults grow to 9 to 12 inches and 10 to 15 pounds. The life expectancy of a Shichon is 15 to 18 years, so rest assured that the little teddy bear with whom you fall in love will be around for a long time. Shichons are very social dogs. They will want to be with you or the family all the time. They're also smart, playful, affectionate, and friendly. They generally love children, but because they're so small, you may have to instruct your children on how to safely handle the dog, especially when he's still a puppy. The bichon-Shih Tzu is so endearing that it's easy to just let them have their way. This is a bad idea. This will lead to a poorly behaved adult dog that no one wants to have around. Training by positive reinforcement is the way to go with these little guys. Be sure to expose your Shichon to different people, situations, and other dogs early. This should be relatively easy to do because they're so portable. Bring them along to the pet store and the dog park (be sure to use the small dog section). Shichons are not known to be "recreational barkers." However, they will alert you to someone they don't know approaching your home. They could become annoyingly vocal if they're bored. While Shichons are not particularly hyper dogs, they are energetic, and they have active little minds. To prevent boredom and burn up that energy, they should be walked daily and have plenty of engaging toys scattered around the house. If the day is too gloomy for a walk, a rousing game of fetch inside should suffice. Shichon puppies are not cheap. The price range for 6- to 9-week-old pups is $1,100 and up. You can get a slightly older Shichon (11 weeks and up) from some Midwest breeders for as low as $400 to $600. In addition to age, prices are also based on markings. Shichon puppies with "bandit markings" (contrasting colored fur around their eyes) are generally the most expensive. Don't squander your investment by feeding your growing puppy poor-quality food. A healthy diet is as important for dogs as it is for us. Get the good stuff, and get food made for puppies because they have different dietary needs than adult dogs. 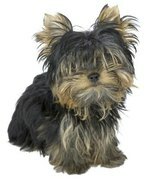 Because their fur is relatively long, Shichons need to be combed regularly to avoid snarls and mats. Although they don't require professional grooming, you might consider a sanitary clip in which the groomer trims the hair under the tail and between the hind legs. This will help prevent "cling-ons" (little dried-up pieces of poop) from sticking to their fur. Your Shichon's eyes should be kept clean, or they'll soon develop clumps of dried-up discharge and fur. When this happens, it's much harder to remove, and removal is very unpleasant for your dog. Use a warm, wet washcloth to remove eye discharge daily or pick up some non-stinging wipes at your pet store.